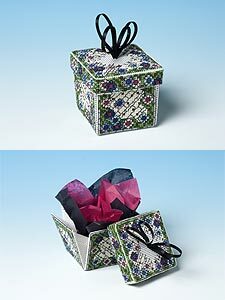 These perforated paper gift boxes are very enjoyable to make. They are worked on 14-count perforated paper, and stand 6 cms high. When the lid is removed, the sides fall open to reveal ... whatever you like! The colourful design is worked around the box sides and lid. Tissue paper is included to wrap your chosen gift, and complete the special box. The kits contain a sheet of perforated paper, backing card, DMC thread, ribbon, tissue paper, needle, chart and full instructions. This design was inspired by a stained glass window which survived the disastrous earthquake and fire in San Francisco in 1906. The box stands 6 cms high, and has a top knot of black ribbon, and is lined with black card.